As discussed yesterday, I think that I like emo and indie a fair bit more than I let on, but when combined tastefully with heavy music I think that these genres reach a new level of potential that is hard to put into mere words. Such is the case with Esoteric Hobbies the latest release from the masterful Toronto group. A project that fuses anthemic melodies, bitter angst and an overarching sense of crushing despair, Esoteric Hobbies continues to ebb and flow through my spirit and mesmerize me with its approach. Pterodactyl Problems is a group who wear a lot of their influences on their sleeves. Hints of Weezer are found throughout, as are touches of American Football or even The Smiths. 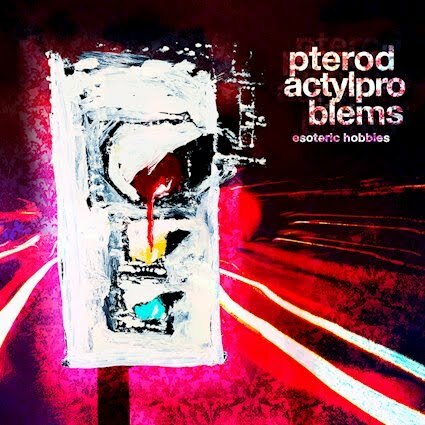 That being said, Esoteric Hobbies also does not shy away from heavier touches, allowing in elements of everyone from Black Sabbath to the Melvins. Yet this is not a record that really embraces heaviness for its own sake but rather uses it as a tool to illustrate powerful contrasts and exciting frills. It means that Esoteric Hobbies is a record that is unafraid to play ball with a variety of angles and approaches as it evolves. Unafraid to sink into rip roaring rock boogies and thrilled on the more bombastic aspects of their sound, Esoteric Hobbies is a fun adventure through rock and roll madness. Pterodactyl Problems are clearly a group of super talented musicians who are bringing all sorts of cool new ideas and approaches to the fore with this new record. They have continued to expand their reputation and develop new concepts on this record and it leaves me extremely curious for more. Decidedly weird and diverse but never losing sight of the core sound, this is indie rock meets metal at its finest.